"Letter To A Philosophical Dropout From Orthodoxy"
In the tradition of Maimonides’ Guide of the Perplexed, Samson Raphael Hirsch’s Nineteen Letters, and C.S. Lewis’ satirical Screwtape, Shalom Carmy’s "Letter To A Philosophical Dropout From Orthodoxy" offers us insight into what it means to be religiously alive, and philosophically engaged by one’s Judaism, in the form of a letter to a questioning seeker. 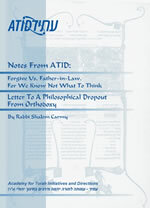 Teachers, rabbis, counselors, and parents entrusted with guiding children, young adults, and all seekers of religious truth, will find value in the disputation of the "don't ask, don't tell" attitude which too often limits Orthodox Judaism to a set of demonstrable normative acts, eviscerating the inner meaning, depth, and force of a philosophically engaged, multi-dimensional Jewish life. Encompassing a tour of topics in the philosophies of science and religion, and a compelling argument for the centrality of the personal in Torah life, this pamphlet provides a sophisticated response to central questions in contemporary Jewish education.